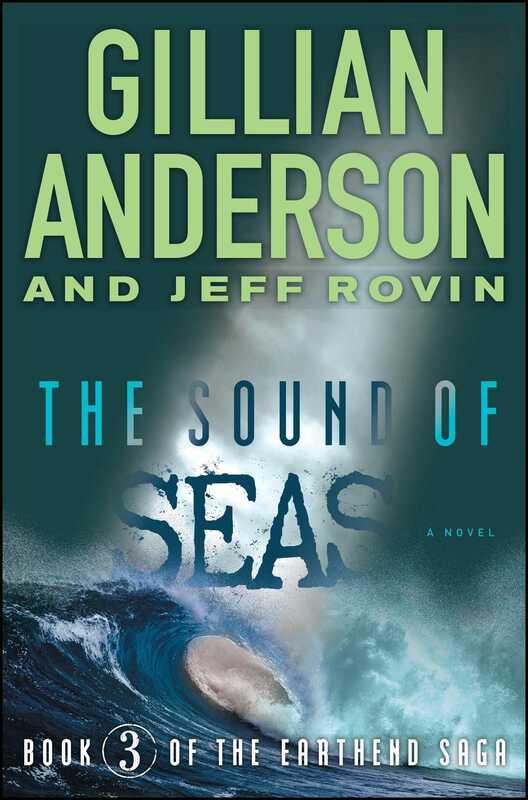 Gillian Anderson’s “addictive” (Marie Claire) paranormal thriller series comes to a thrilling conclusion in The Sound of Seas, involving time travel, ghosts, alien technology, and strange spiritual powers…the perfect combination for X-Files fans. It was nearly dawn when an exhausted Ben Moss left Lenox Hill Hospital on Manhattan’s Upper East Side. No, that is not entirely true, he thought. What is very real is that Caitlin is presently unconscious and nonresponsive. Yet even as he thought that, his arms moved. He had been spending all his spare time trying to piece together and translate the language of Galderkhaan—so much time that it seemed almost unnatural not to make superlative hand gestures as he spoke. That too was a new normal. Along with watching people who unconsciously moved their hands as they spoke, wondering, Are you descended from Galderkhaani? Ben walked onto Third Avenue, into the lamplit darkness of the New York predawn. It was late fall and, in addition to the darkness, a cold wind swept in from the East River, adding to his sense of desolation. He was unsure what to do next. That unfamiliar confusion frightened him. Typically, Ben followed the lead of the UN ambassadors. He didn’t have to plan very much, to think further than the next few words. The one time he had tried doing that, as a student at NYU—loving Caitlin—it ended with an estrangement that lasted for years. Galderkhaan had brought back all the old fears of wanting something, of planning for something, of being disappointed. Now Caitlin’s life might hang on him reengaging. Not being a family member, Ben was only able to get answers from attending physician Peter Yang because the linguist was the only one who could explain—more or less—what had brought Caitlin to this condition. “You told the EMT that she was—self-hypnotizing in the park?” Dr. Yang had asked as they stood in the hospital waiting room. “Yes,” Ben had said. That was the only way he could think to describe what he suspected was going on. “Do you know why?” the doctor had enquired. “Several?” the doctor had asked. “Similar reactions to psychological trauma,” Ben replied. “That is what she was—exploring,” he said carefully. He answered yes to the last two, explaining—once again, revealing as little as possible—that Dr. O’Hara had been treating patients who suffered from both of those and she had experienced a kind of empathetic blowback. The doctor seemed less alarmed when he learned there was a context for the experiments. The diagnosis, for now, was psychogenic unresponsiveness. Dr. Yang said they would keep her in the hospital for more tests, but that was all he would say. Ben would have to find out more from Caitlin’s parents. He had phoned them, waking them, trying and failing not to alarm them. It was one of the few times his smooth British accent and composure had been a total fail. They were on their way in from Long Island. So Ben left the complex, largely uninformed, not quite aware of what had happened, and utterly unsure what to do next. There were no phone messages. He hadn’t expected any; neither Anita Carter nor Flora Davies had his cell number. Anita was a colleague and friend of Caitlin’s, a psychiatrist who had stayed with Caitlin’s son, Jacob, at the apartment; Davies was the head of the Group, an organization based in a Fifth Avenue mansion and which collected information and relics from Galderkhaan. Ben did not know anything about the latter. Neither had Caitlin before she went down to its headquarters, a visit that led directly to her collapse in the adjacent Washington Square Park. Bundled against the cold, Ben decided to do what he always did: take small steps and see where they went. He paused in the doorway of an office building to call Caitlin’s landline, to make sure Jacob was all right. That was what Caitlin would have wanted him to do. Anita picked up in the middle of the second ring. She said that the ten-year-old was in his room, up early after a restless night, but that there was something more pressing. “The great serpent!” Ben heard a woman’s voice say in the background. Ben sat back in the cab, watched the video display in the seat, saw the news alert from Washington Square. There weren’t just fires; there were floods, water-main breaks, crowds of students who were being hustled from dorms into the streets. The driver was talking to someone in Nepali on his Bluetooth. Ben couldn’t even tune it out; he understood everything about the family’s dispute with the city over a dangerous school crossing in Queens. Noise and unrest, Ben thought. It didn’t end with the tamping down of the tensions between India and Pakistan. It just went back underground, unsettling everyone at a low boil. Thanks to Caitlin and her commitment to helping, he was now acutely aware of it. Tears pressed against the backs of his eyes as he thought of the girl he had shared so much with, who he had strongly reconnected with over Maanik, who he was now helplessly in love with. He wanted her back not just from this crisis but in all ways, and he didn’t know how to go about any of it. Baby steps? Ben thought with sharp self-reproach. His limited research into Galderkhaan barely translated the fragments of ancient language they possessed, let alone provided insights into the existence of souls in the Ascendant, Transcendent, and Candescent realms. How was he supposed to help Caitlin with this? Maybe the madame has insights, he thought then hoped. The priestess had been helpful in Haiti. She certainly has some kind of second sight. As the cab sped west across Central Park, Ben tried to be useful—and consoled—by applying himself to the purely scholarly side of the problem. He was amazed at how much cultural overlap had been revealed among Galderkhaani, Vodou, Hindu, and Viking lore—peoples who had no contact in the dawn of our known civilization. Yet, the same cultural archetypes appeared. Inevitability? Or was it something deeper. Was there a connection that went back to this civilization that predated all others? How can that not be the case? he asked himself. Nor was this the time to figure it out. He did not see how that kind of research would help Caitlin. By the time the taxi reached Caitlin’s Upper West Side apartment building, the morning had already blossomed into early dog walkers, rattling breakfast carts, and loud delivery trucks. The bustle seemed to be happening outside a bubble, a combination of exhaustion and distraction. Even the driver’s ongoing school-crossing issue seemed to belong to some other time and place. And then, suddenly, there was a wave of fear—not unwarranted. No sooner had Ben emerged from the cab than a man stepped up to him. The newcomer was about five-ten, a little shorter than Ben, and in his forties. He was wearing jeans, work boots, and a black beret. His eyes were covered with reflective sunglasses with fashionable white frames. He held his smartphone in his left hand. His right hand was thrust deep into the pocket of his heavy leather jacket. “Mr. Moss,” the man said. It wasn’t a question. The man’s voice possessed a faint but distinctive accent, which Ben placed as Icelandic. It was uncommon here, and in spite of everything—or because of it—Ben gave the man his attention, but not until after he had looked around. “I see. You mentioned the Group. How do you know those people?” Ben asked. Ben was a little rocked by that—not just the fact that someone else knew about the place, but obviously knew more than he did. Then his mind returned to what he had just been thinking about, what he knew of the postapocalyptic trek of the Galderkhaani up through Asia to points north, including Scandinavia. “Are you some kind of rogue scholar?” he asked. “Not exactly,” the man replied. “Not yet,” the man said with a hint of menace now. He moved closer. Ben hesitated. He had been around enough diplomats to know when polite insistence was about to shade into a threat. “Do the doctors know what is wrong with Dr. O’Hara?” Eilifir asked. “Becoming lost in the past,” the man said. “How do you know . . . what do you know?” Ben asked. “Is that what happened here?” Ben asked with alarm. Ben did not tell the man that it was the second time that morning he’d heard that sentiment. It was as fantastic and sobering a monologue as any Ben had ever heard—and, in the United Nations, he had translated many of those. “Where will you be?” Ben asked. “Right here,” Eilifir said, backing away. Though the air was warming slightly, Ben felt cold inside. Without another word, he turned and went into the apartment.